Hang out with us on Friday Nights! 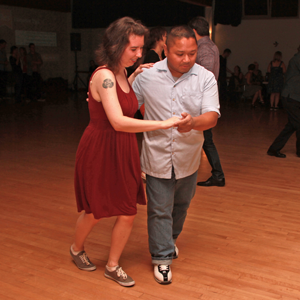 Every Friday night, 7:45pm to 8:30pm before the dance starts, there is a beginner drop-in dance lesson. Our dance lessons have a reputation for providing the very basics for dancers who have never danced before, but also contain different moves taught in the lessons every week. Dancers attending regularly can build up a repertoire of dance moves. We have dancers with years of experience attending our drop-in lessons because they are so much fun, and they can still learn new things. This seeds the drop-in lesson with experienced dancers who can help all those new dancers pick up the basics. Single step rhythm east coast basic with lindy hop pulsing and connection. Moves are inspired (or possibly completely the same) by movements in all forms of swing dancing including Lindy hop, West coast swing, Balboa, Charleston and Shag. We are more than a social dance venue. Floor opens up at 8:30PM for dancing until 11:45. Floor opens up at 8:30PM for dancing until 11:45PM. *Cash only. Please note that punch cards and Groupons may not be used on band nights. When going outside for fresh air, we ask everyone to keep their volume down. After 10pm we encourage everyone to exit the back door of the hall, to avoid people being noisy in the front of the building. Those wishing to just cool down, please walk down the lane to Columbia street or go downstairs in the hall. Parking: There is free parking behind the hall or on Keary Street, there is 2hr parking until 8, about half a block west of the hall. There are metered street parking spots to the east of the hall and on Columbia street. Pay for 10 dances in advance and get one dance for FREE! Note: Payment is cash only! Get in FREE on your birthday! All you need to do is send us an email to rcsmessage@gmail.com with Birthday in the subject line and provide your name, birthdate* and the first and last names of up to 5 friends and we’ll put you on the VIP list!. ** Email must be in by Thursday at midnight. We will be in contact with you to confirm the information you have submitted. *Actual birthday must be within two weeks of the dance. **On band nights the birthday guest will get in free, and up to 5 friends will receive a discounted admission price of $12 each. 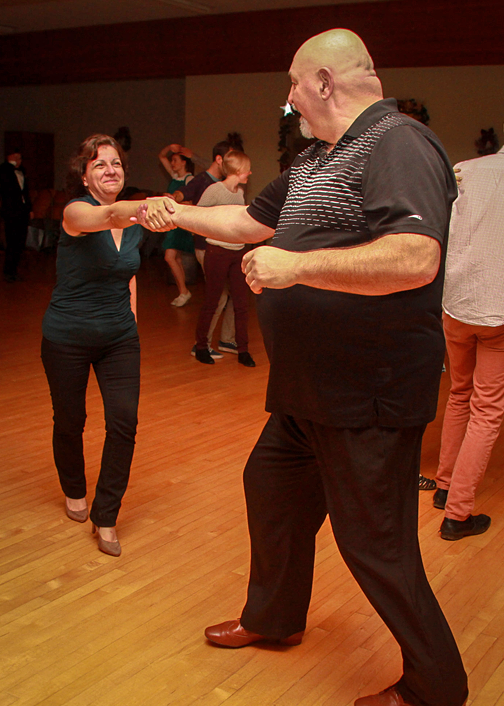 Social dancing is about partnership, enjoyment, and exercise. 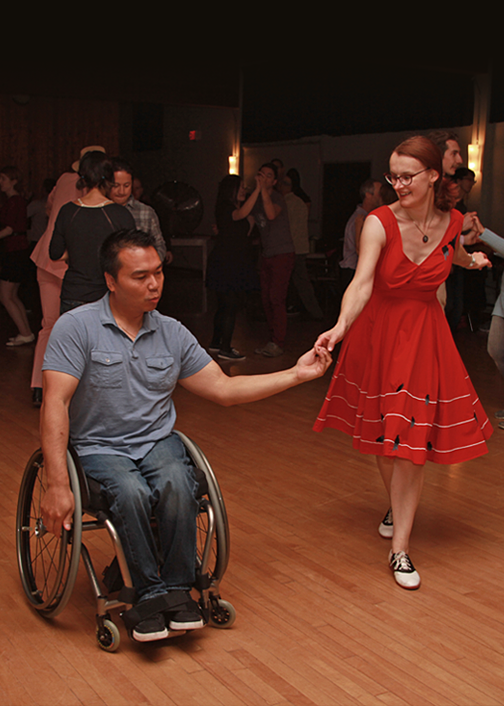 Everyone can learn, and Royal City Swing is a great place for getting you on the dance floor to success! Every Friday is an opportunity to connect with friends and make new ones. Throughout the year we'll have different DJ's and live bands to provide great music to dance to. We also offer dance workshops to help you learn more about the various dances that are part of the swing family. Lookout for special announcements for upcoming dance workshops, live bands, and special events. In social dancing, leads and follows are spontaneously open to the infinite possibilities of the moment, responding to one’s partner and to the music. Meet the dedicated team bringing you a fun and friendly atmosphere to dance at Royal City Swing for Vancouver, New Westminster and all the Lower Mainland dancers! Nicola began swing dancing in 2001 and it was a quick trip into love. She danced every night of the week she possibly could. For 6 years she made the most of her hobby participating in a team performances, competitions, teaching, workshops and has danced for both film and tv. In 2007 she underwent two foot surgery's and has since had two beautiful children. Though she danced with casts, crutches and into her ninth month of pregnancy twice, the slow down has been a hard adjustment for her. She is excited to be a part of the amazing team launching this new venue and can't wait for you to come and ask her to dance! Initially introduced to swing back in '98 at UBC, and completely hooked by '01 Kyle loves the variety in swing. The majority of his vacations now are centered around dancing, hitting up dance scenes in Jeju Korea, Osaka & Tokyo Japan, LA, Portland, and Seattle in the past year alone. On and off instructing since '03 and performing with the Jitterbug Junkies since '04, he looks forward to continue to promote swing in the lower mainland with RCS! Kyle has been blues and fusion dancing for 6 years, and teaching for 3. He has joined forces with FUSE, a monthly Fusion dance, and teaches blues beginner and intermediate series at UBC for the past 3 years. Initially dragged out dancing by a friend in 2003, Natsuko found passion for dance learning East Coast Swing, Lindy Hop, Collegiate Shag and Balboa. Recruited to perform for the Jitterbug Junkies having danced less than a year in 2004, and with no fear of heights, Natsuko found another passion: mastering high flying, high speed aerials. In recent years, Nat has expanded her dancing getting into Salsa, Blues and West Coast swing along side growing her excitement for swing by traveling to Japan, Korea, LA, Seattle, and Portland to dance. Now she is excited to help you get excited and out on the dance floor with her infectious smile at Royal City Swing. 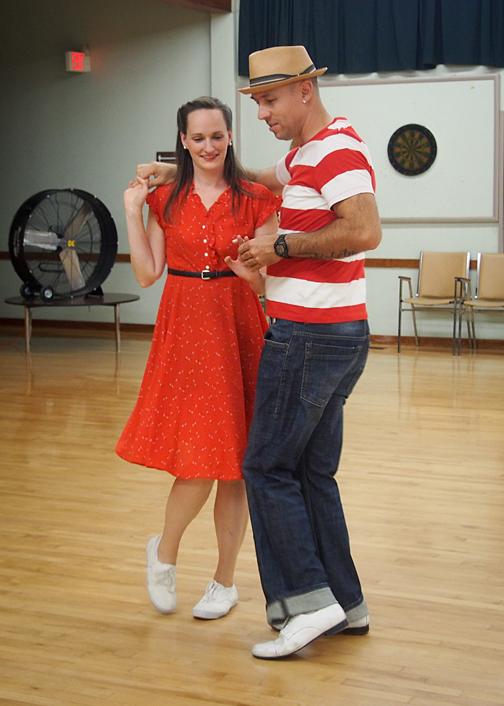 Born with two tone dance shoes on his feet, Afonso is one of the lower mainland's longest continuous swing dancers. Starting back in the swing revival of the 90's, Afonso has been teaching Lindy Hop, Shag, Balboa and East coast swing (including aerials!) throughout the lower mainland for well over a decade. He founded the Jitterbug Junkies, a swing performance team, in 2003 where he choreographed and performed for 6 years. He also has danced in competitions, for film and tv, charity and public festivals and events. He considers it his calling to promote swing dance through teaching across the lower mainland and now by opening up the lower mainlands newest venue - Royal City Swing.